Ketupat (in Indonesian and Malay), Kupat (in Javanese and Sundanese) or Tipat (in Balinese) is a type of dumpling made from rice packed inside a diamond-shaped container of woven palm leaf pouch. It is commonly found in Indonesia, Malaysia, Brunei, Singapore, and the Philippines (where it is known by the name pusô in Cebuano, piyoso in Maranao, Iranun, and Maguindanao, bugnóy in Hiligaynon, patupat in Kapampangan and Pangasinan, or ta’mu in Tausug). It is commonly described as "packed rice", although there are other types of similar packed rices such as lontong and bakchang. Ketupat is cut open, its skin (woven palm leaf) being removed, the inner rice cake is cut in pieces, and served as staple food, as the replacement of plain steamed rice. It usually eaten with rendang, opor ayam, sayur labu (chayote soup), sambal goreng hati (liver in sambal) or served as an accompaniment to satay (chicken or beef or lamb in skewers) or gado-gado (mixed vegetables with peanut sauce). Ketupat is also the main element of certain dishes such as ketupat sayur (ketupat in chayote soup with tofu and boiled egg) and kupat tahu (ketupat and tofu in peanut sauce). The use of woven young palm leaves (janur) fronds as a pouch to cook food is widespread in Maritime Southeast Asia, from Indonesia, Malaysia, to the Philippines. Ketupat is made from rice that has been wrapped in a woven palm leaf pouch and boiled. As the rice cooks, the grains expand to fill the pouch and the rice becomes compressed. This method of cooking gives the ketupat its characteristic form and texture of a rice dumpling. In Java and most of Indonesia, ketupat is linked to Islamic tradition of lebaran (Eid ul-Fitr). The earliest connection of ketupat with Islamic lebaran tradition is believed to be originated in 15th-century Sultanate of Demak. Nevertheless, ketupat is also known in non-Muslim communities, such as Hindu Balinese and people of the Philippines, which suggested that the weaving of coconut fronds has pre-Islamic origin. It was linked to the local Hindu ritual on venerating Dewi Sri, the Javanese goddess of rice. The Balinese Hindus still weaved the Cili fronds effigy of Dewi Sri as an offering, as well as weaving tipat fronds during Kuningan Balinese Hindu holy day. According to Javanese traditions, the Indonesian lebaran tradition was first started when Sunan Bonang, one of Wali Songo of Tuban in 15th-century Java, calls for the Muslims to elevate the perfection of their Ramadhan fast by asking forgiveness and forgiving others' wrongdoings. The tradition on preparing and consuming ketupat or kupat in Javanese language during lebaran is believed to be introduced by Raden Mas Sahid or Sunan Kalijaga, one of Wali Songo (nine Muslim saints) that spread Islam in Java. Sunan Kalijaga introduced the lebaran ketupat ritual on 8 Shawwal, a week after Eid ul-Fitr and a day after a six-day Shawwal fast. It is believed that it contains appropriate symbolism; kupat means ngaku lepat or "admitting one's mistakes" in Javanese language, in accordance to asking for forgiveness tradition during lebaran. The crossed weaving of palm leaves symbolizes mistakes and sins committed by human beings, and the inner whitish rice cake symbolize purity and deliverance from sins after observing Ramadhan fast, prayer and rituals. Other than Java, the tradition on consuming ketupat during Eid ul-Fitr is also can be found throughout Indonesia; from Sumatra, Kalimantan, Sulawesi, Nusa Tenggara. Among Hindu communities in Bali and Banyuwangi in East Java, ketupat is part of the offering and ritual of Kuningan festive celebration to conclude the Galungan holy days. During Galungan, Hindu families create and erect a penjor pole made of janur (young palm leaves), and then make some offerings to the Pura. Ten days after Galungan, the ceremony of Kuningan is observed to conclude the religious holy days. To celebrate Kuningan, Balinese Hindu families make tipat or ketupat first as offering, and then they consume some ketupat afterwards. There are some striking similarities between Javanese Muslim Lebaran and Balinese Hindu Galungan-Kuningan holy days, of which ketupat is one. For example, the families pay a visit to the grave of their family or ancestors prior of observing the holy day, and they consume ketupat to conclude the religious festival. Although today in contemporary Indonesia, ketupat is strongly associated with Muslim celebration of Idul Fitri, this parallel phenomenon suggested the pre-Islamic native origin of ketupat, as Native Indonesian ways to shows gratitude and to celebrate festivities by making and consuming certain kind of food. Ketupat daun palas, a triangle version of the ketupat, primarily found in Northen Malay Peninsular. Among the Moro (Muslim Filipino) groups of the Philippines, ketupat, known as piyoso or ta'mu, is served with an array of dishes including tiyulah itum, rendang, ginataang manok, pyanggang, kulma and satti. It is served during special occasions such as Hari Raya Eid'l Fitr, Hari Raya Eid'l Adha and weddings. 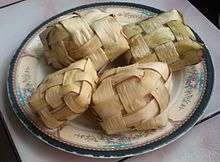 Among Christian Filipinos, pusô, as ketupat is locally known, is also traditionally used as a pabaon or a packed lunch, traditionally brought by workers, served with any selection of stews. Pusô is also widely eaten in the side streets of Cebu with pork or chicken skewers and other grilled selections. One of popular street food in Indonesian cities is Ketupat sayur which literary means "ketupat in vegetables soup". Ketupat sayur is known in two popular versions; the Betawi version from Jakarta and katupek sayua the Padang version from West Sumatra. Ketupat sayur is popular as breakfast fare in Jakarta and Padang. It consist of ketupat served with sliced labu siam (chayote) and unripe jackfruit gulai in thin and spicy coconut milk soup, topped with cooked tofu and telur pindang (spiced boiled egg), and krupuk crackers. If lontong was used in the identical recipe, it is called lontong sayur instead. 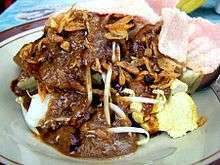 ↑ "Calories in indonesian food ketupat sayur". My Fitness Pal. 1 2 Sri Lestari (20 January 2015). "Tipat Cantok, Kuliner Khas Bali yang Tak Membosankan". Kompas.com (in Indonesian). Retrieved 22 January 2015. 1 2 3 4 5 Panca Nugraha and Suherdjoko (5 August 2014). "Muslims celebrate Lebaran Ketupat a week after Idul Fitri". The Jakarta Post. Retrieved 22 January 2015. 1 2 Jay Akbar. "Mengunyah Sejarah Ketupat" (in Indonesian). Historia. Retrieved 1 July 2013. 1 2 3 4 5 6 "Galungan Mirip Lebaran". Bali Post (in Indonesian). 10 October 2009. Retrieved 22 January 2015. 1 2 Mahfud MD: "Sejarah Lebaran"
1 2 Heriyono (7 Aug 2013). "Idul Fitri, Kenapa Muslim di Indonesia Makan Ketupat?". Aktual.co (in Indonesian). Aktual.co. Retrieved 9 August 2013. ↑ "exploring cebus bantayan and virgin islands". ↑ "'Puso' makers suffer from high rice price". ↑ "Satti curacha imbao salmuera butong pie Zamboangas specialties". ↑ Preap Kol (5 May 2008). "The Outstanding Youth Picnic". The Outstanding Youth Group of Cambodia. Retrieved 20 January 2015. ↑ Siem Pichnorak (16 July 2013). "Cambodian Rice Cakes". ASEAN-Korean Centre. Retrieved 20 January 2015.